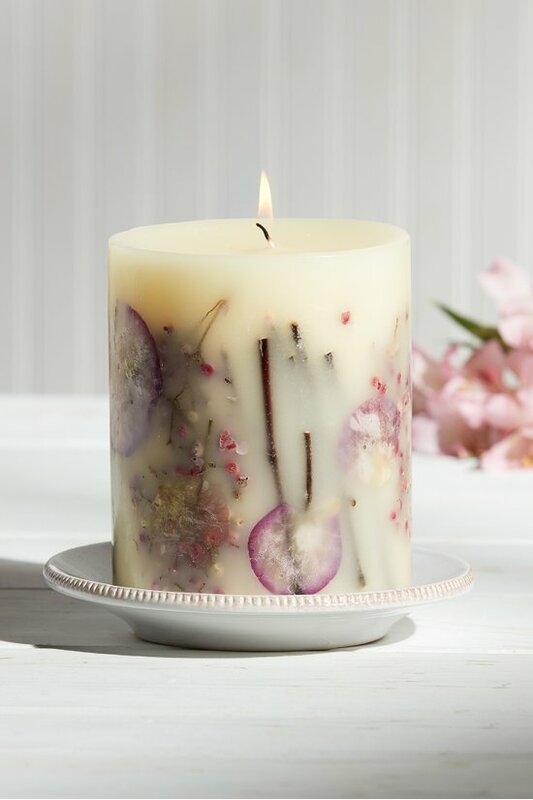 A hand-poured candle, filled with real fruit, shells and spices creates a lovely accent in your home. But the real magic happens when you light the cotton wick and the candle slowly begins to burn. All the elements encased in the proprietary wax blend begin to glow and enchant. And the fragrance that fills your home is simply amazing. · 5.5"h x 4.5" dia. Rosy Rings' hand-poured candles and fragrances bring the loveliest notes of nature home. Perfectly-ripe fruit, earthy spices, natural shells and delicate botanicals add stunning beauty to the soy and beeswax candles and fragranced diffuser oil. Lovingly handcrafted in Denver, Colorado.